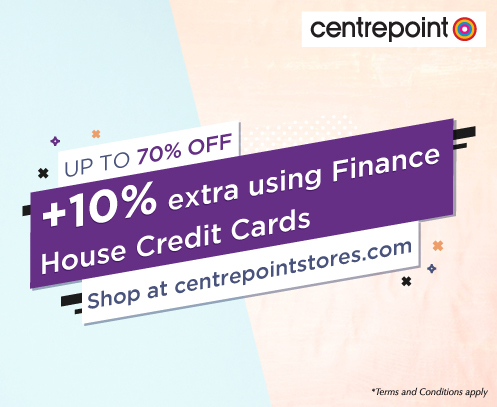 Up to 70% Discount & an EXTRA 10% with Finance House & CartNet Credit Card! Shop online at www.Centrepointstores.com or through the “Centrepoint Online” Mobile App and choose from a wide selection of products, including; men’s and women’s fashion, baby essentials, beauty and décor and save! Shipments will be delivered to your chosen location. The offer is valid from 21 February 2019 until 1 March 2019. *Terms & Conditions apply for the above merchants.